When I took this photo I didn’t notice the bat. That’s probably a good thing. Photo taken in Malaysia. This entry was posted in Travel Photos and tagged Asia, Bats, Borneo, Fears, Malaysia, Nature, Photo, Photography, Sabah, South East Asia, Travel, Travel Blog, Travel Journal, Travel Photo, Wildlife. Bookmark the permalink. The Better Half has been quoting Ace Ventura a lot lately. I need to rewatch it. It was actually really dark along that walkway to our cabin. 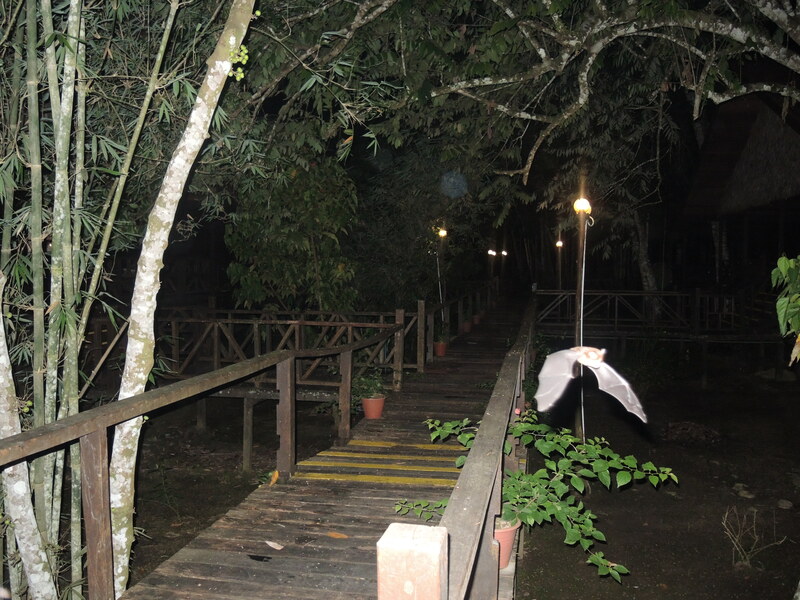 During dinner the bats kept swooping down on us–we ate outside. Let’s just say, a lot of people didn’t like that. That’s a good way of thinking of him. Only thing that could make it creepier was if the bat was flying toward you! Imagine that as you snapped the photo. Picture this. Me dropping the camera and running in every direction waving my arms in the air and screaming. I would run away from a bat if it were coming at me. If I had known, I would have.